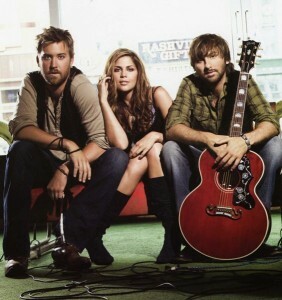 Lady Antebellum is taking over the country world. Their second album has already sold more than 2 million copies. The first two singles from that record have shot straight to #1. There was a recent win for Group Video of the Year at the CMT Music Awards. They’re selling out concerts in record time (Lady Antebellum Sell Out Augusta Show in Record Time). The group is even finding viral video success with a parody of another popular country tune. See Lady Antebellum – A Little More Preppy Than That. There appears to be no stopping the charismatic country trio. The success Lady A is having right now reminds me of Rascal Flatts’ success during their 2nd, 3rd, and 4th album releases. Nothing is bigger in country music right now than Lady Antebellum. Lady A’s latest conquest comes with their new video for the single Our Kind Of Love . The song has the trademark Lady Antebellum sound – groovy with almost a summer love feel to it. This song is already climbing the charts fast and appears well on its way to becoming one of the favorite country summer songs. The video seems to capture the feel of falling in young love with the backdrop of a summer setting. With another great song Lady A continues their climb to superstar status. Do you like the song and video for Our Kind Of Love ?